When people I know head off to America on their holiday, itâ€™s usually to one of three places: New York, Las Vegas, or Disneyworld (those flights to Orlando are certainly popular with young families). Of course, thereâ€™s far more to see than a handful of tourist towns: even in Florida. Personally I much prefer taking flights to Miami. Partly because I enjoyed playing Grand Theft Auto: Vice City a lot as a teenager but mostly because itâ€™s one of the most diverse and dynamic destinations Iâ€™ve ever been to. Donâ€™t assume that because Miami is in the USA that you can leave your phrasebook at home. Almost 67% of the cityâ€™s population speaks Spanish as a first language. Most people will be able to speak to you in English, but remember key phrases like por favor (please) and gracias (thank you) to keep people on side. So if youâ€™re in Miami and youâ€™re looking for some Hispanic flavour, where should you go? The first place you should head is Little Havana, named for the capital of Cuba. The streets in this neighbourhood are colourful, latin beats pour out of every doorway, and locals sit outside coffee shops sipping tiny cups of strong Cuban coffee. Youâ€™ll feel as though youâ€™ve been transported to another country. 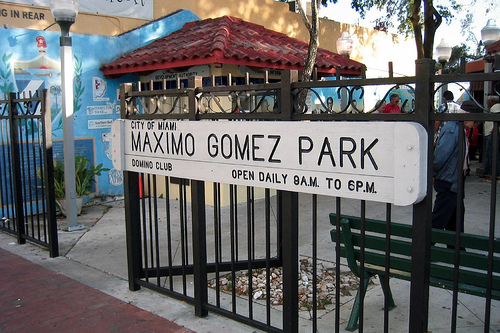 Must seets in the area are Domino Park on Calle Ocho and the Cuban Memorial Boulevard. Donâ€™t be scared to pop into the little hole in the wall bodegas: people here are generally friendly. For a bit of culture, head down to the Florida Museum of Hispanic and Latin American Art on Aurora Street. Itâ€™s the only museum in the world to showcase this type of art exclusively, with over 300 sculptures, paintings and ceramics from all over Latin America. Itâ€™s a good place to shelter from the heat, once you get bored of the beach. During the year the museum plays host to exclusive exhibitions, too: be sure to check their website before you arrive to find out whatâ€™s on. Food is one of the most important aspects of any culture, so if you really want to drink in the Latin flavours of Miami visit one of the many Spanish restaurants. Thereâ€™s an absolute plethora of different types of Hispanic cuisine: Peruvian, Argentinean, Nicaraguan, Cuban… you really will be spoiled for choice. Of course itâ€™s worth doing a bit of research yourself, but personally Iâ€™d recommend Ola at the Sanctuary for neuvo Latin cuisine. Brown sugar crusted salmon, ceviche, empanadas and kobe beef meatballs really showcase the best in Southern American cooking. If you want to sample the Cuban food Miami is famous for, one of the best places in Miami to do so is La Rosa. The seafood and steaks are great, and itâ€™s a favourite for many locals. Wander around town, youâ€™ll soon find somewhere to tickle your tastebuds. Meat lovers must seek out an Argentinian restaurant (most bring unlimited meat to your table, with side orders of avocado and yucca). If you prefer mild food, find a Colombian restaurant. For a lunchtime snack grab a Cuban sandwich: ham, pork, cheese, pickles, mustard, and mayo grilled on eggy bread. Itâ€™s a bit of a local delicacy, so get stuck in. Whether youâ€™re passing through Miami or spending your entire holiday there, youâ€™ll be sure to have a great time.